I have a big tub full of scraps.....I don't know how to begin sewing them together. Do I cut them all the same size? Sew lengths together? Make blocks? I've been tryinig to look for tutorials on how to begin a scrappy quilt and get so frustrated. Also, do I sort them by colors? Blocks? Lengths? Any input would be sincerely appreciated. I've been cutting all of my scraps to 2.5" squares. I may start doing some 2.5" strips and even considered doing a bunch of 1.5" strips to do some of those strippy blocks. You can check out Bonnie Hunters blog at http://quiltville.blogspot.com/ she has lots of free scrap patterns and ideas this might help you. 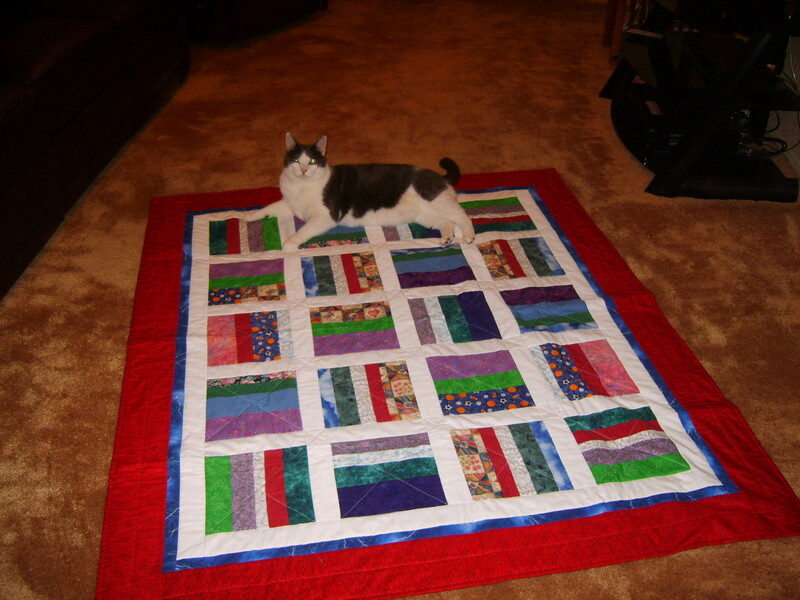 go to the archive and look for the scrappy quilt pictures here on QB. Lots of great ideas there. Even with scrappy quilts, I like to choose a pattern first, and then make an assessment on the colors and values of the scraps that I have. In my favorite scrappy quilts, there is at least one element of continuity in them. 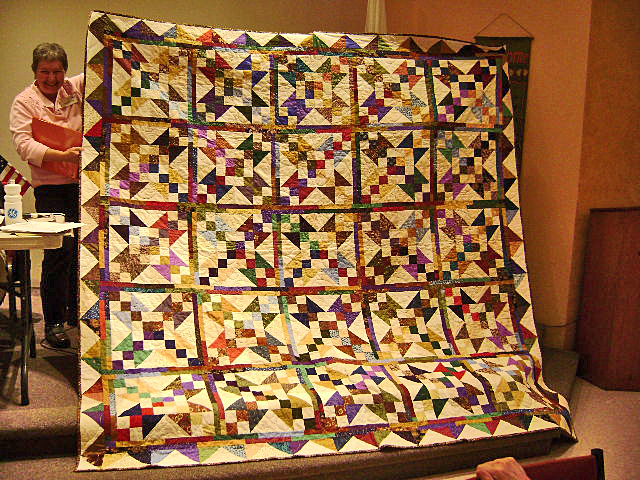 In the beautiful quilt shown (from American Patchwork and Quilting), the same block is repeated throughout, and the light fabrics are all from a similar color grouping of cream. It gives the eye a place to rest. I don't cut my scraps till I know what pattern I want to use. At one time I did cut them before having an idea and the pattern I had finally had my heart set on was not the size of the pieces I cut. So now I just sort by lights , mediums and darks.. Some get sorted by type batik, metalic and other. I do have a bin of fall color fabrics , as that colorway is the one I favor most. My advise .. pick a pattern then sort , then cut. I second the vote for Bonnie Hunter's Quiltville site. She has many free patterns and tutorials for using scraps. I love the small tumbler quilt for using up scraps, most of the time I don't think about colors...I just sew them together. The Twister is also a great one for scraps. There are a lot of tutorials about quilts Go to YouTube and I'm sure others on the board will have other suggestions. you could separate with colors, blues, greens, reds, yellows, beiges/ off whites and whites. there are lots of ways to make a scrappy quilt- some people cut their scraps into certain sizes & use a pattern- I've made lots of string quilts (strips of various widths/lengths sewn to a square foundation) and crazy quilt style blocks- where I cut a piece of muslin in a particular size (often about 10" is my favorite) then I use different sizes/shapes of scraps- adding them to the *foundation* until it is covered- the trim the edges even & sew the blocks together. some people like (planned scrappy) where they separate their colors - some people toss their scraps into a brown paper sack- sit down at their machine- reach in pull out a scrap- reach in pull out another one & sew them together- adding all around as they pull out each piece- until they reach a size they like- then just square them up... the great thing about scraps are- just be adventurous- try new things- have fun with them. I can relate.... would like to do a scrappy quilt and have lots of scraps but I have a question. 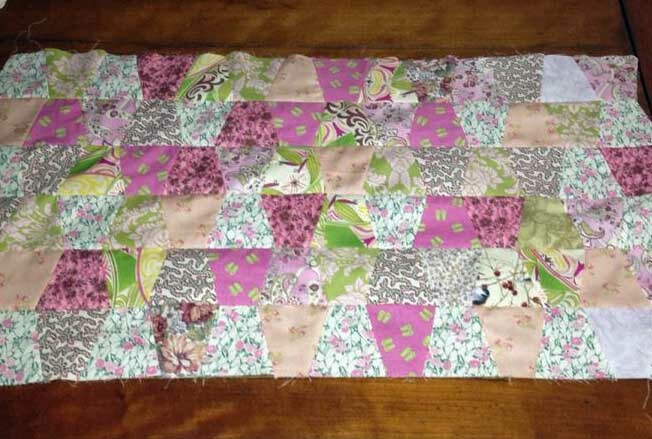 When you pull those scraps out to sew them together, do you press them first? It seems like they wouldn't lay flat otherwise. What do you all do? I had some left over 4 1/2 inch squares and just decided to make a scrappy with them as they were. I ended up liking the results. Sort of primitive, compared to the others here, but I liked it. Let me see if I can find a picture. Okay, this is before I got it quilted, but I just used SID and was very happy with it. Maybe this will give you an idea of what you might want to do. Obviously, it was easy. Oh wait, I have another scrappy too, sort of a controlled scrappy. Let me see if I can find it. 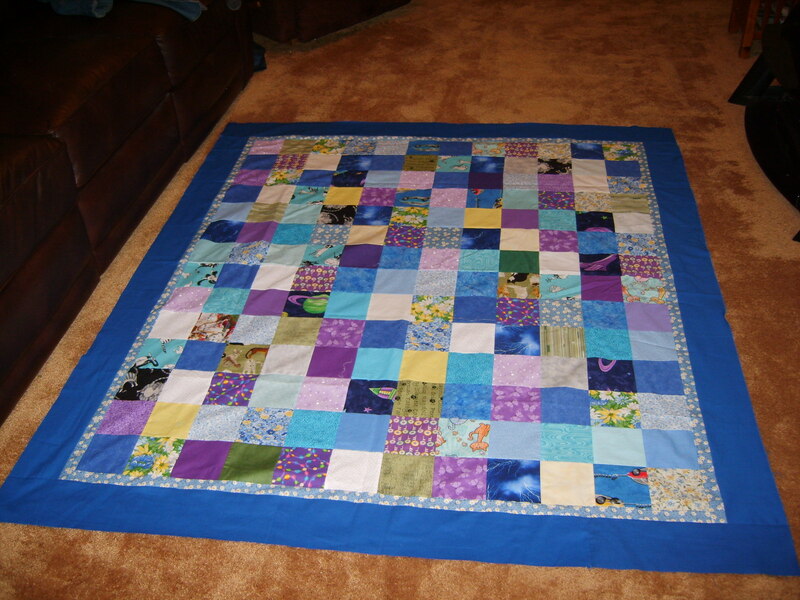 I made it after I got a "grab bag" of 2 1/2 strips from our guild and the challenge was to make a quilt. Thanks for sharing, I love it. For our wonderful Golden Retriever adopted in March of 2010. After finishing a project all left over fabric is cut into squares or strips before I begin another project. That is the only way to keep them from gettin ahead of you. Thanks. My quilt inspector "helps" with everything! !